My Collie named Camille is 14 years of age. I have a 3 year old dalmatian called Speckle that has been good for her. Speck has kept her active until recently. Now Camille is starting to slow down and I cannot get her to walk with Speck at the same time. Camille wants to stop at almost every yard to smell and leave her scent. She has never done this before the last few months. Poor Speck becomes agitated that we are not walking. We are constantly stopping for Camille to check out smells. Camille has always obeyed well and I have never had to be strong willed with her. I have tried this a bit lately but it does not phase her. She ignores me and goes on sniffing the grass. She is very strong. Should I just walk them separately? Speck wants and needs a longer walk than Camille anyway. I don't know what else to do to keep everyone happy. Thank you for any advice you can give me. First let me say 14 years represents a long wonderful lifetime for both you and your Collie as most dogs are considered “seniors” beginning at 7-8 years of age. Active for her age until recently, she has reached that point in her senior life where she has to walk slower, and being less active, she may prefer to sniff and mark instead of playing and running. It is her way of entertaining herself and it doesn’t take much energy. 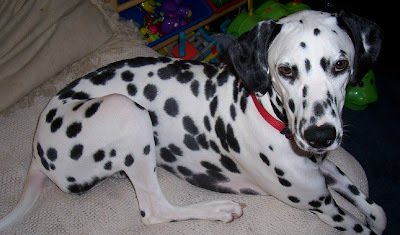 You also have a young and energetic Dalmatian, Speckle, who is inspiring to Camille and they have formed a close bond. Of course you would like to continue walking them together. But when it comes to their daily walking and exercise needs, you are going to have to make some adjustments. As dogs age their veterinary, nutritional, and exercise needs change (see recommended reading below). Camille’s exercise routine at her age should include at least two short walks daily* at her pace, which you say is now slow. If she is content to take her time sniffing and marking, then keep her walks short and interesting for her. If she is already trained to heel and you didn’t have a pulling problem in the past, allow her a longer leash so she can reach interesting smells without pulling or dragging you. If she is walking with her head and nose very close to the ground most of the time, have your veterinarian check her vision. You can submit questions on geriatric care to All Things Dog Blog columnist Dr. Jacki, DVM, by writing to her at LetsAdoptaDogPark@gmail.com. She is a graduate of Auburn University and has been practicing veterinary medicine for over 12 years. Your 3 year old Dalmatian’s exercise needs have not changed. Dalmatians are active dogs with an affinity for running, and they need brisk long walks and frequent opportunities to run and play freely in fenced areas. Before attempting to walk both dogs together, try taking Speckle out for a brisk 30 – 45 minute walk and/or play time first, to release some of his energy. You should be able to walk Camille and Speckle together once Speckle has been sufficiently exercised. Your Dalmatian’s needs must still be met, and since your Collie is content with a short leisurely walk, I’d exercise Speckle before the walk with Camille. If Speckle is still not cooperative, it’s okay to have him wait for you at home. Camille will probably be very excited to be able to take her time walking, and sniffing, and marking, without being rushed by this young pup. *Be sure your senior dog gets a complete geriatric check-up and discuss any questions or concerns you have about senior health, exercise, and the aging process with your veterinarian. Older dogs are likely to have joint stiffness, hip dysplasia or other age related medical problems that could affect their exercise capabilities. Isn't Molly-Pepper adorable modeling for us! She's a beautiful Dalmatian.